The Wakehurst Place Botanical Gardens are one of the last places in Britain where it is possible to find natural meadow or forest. Most meadows across the country are scoured of their native inhabiting grasses and flowers through centuries of management, farmers choosing to plant crops or new, often Italian, grasses that take more easily to fertilisers and provide a healthy and easy to grow feedstock for their animals. This makes true natural meadow, with actual British wildlife very rare, so it was interesting to see what species lived in one of the last preserved meadows. Using measuring tape and a set of quadrats, we created a transect leading from the middle of the meadow towards the managed treeline of the neighbouring forest. 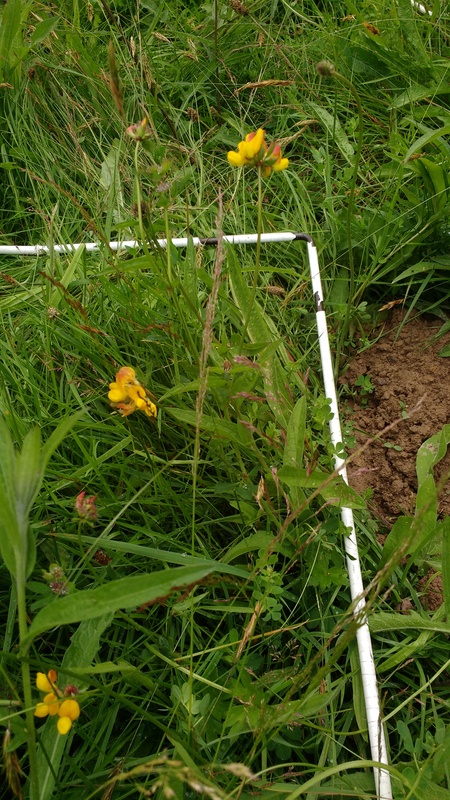 A quadrat is a square metal frame, 1m by 1m in area, used by Biologists to take a sample of a habitat and measure the diversity and species abundance of the whole area. It would be ridiculous and time consuming to search the whole field and note down what lived there, but by taking this sample, I could get an idea of what lived in the rest of the field, while also seeing how the species abundance changed as I approached the forest. In the centre of the field the field grass coverage was near absolute, with gaps in the green breaking out where moles had previously tunnelled to the surface, and apart from the occasional buttercup or ribwort plantain, not many larger plants lived there. As we approached the forest line, however, we found a greater abundance of different plants, the biodiversity increasing as the shade of the forest made it harder for the grass to dominate the land. Species like knapweed, devil’s-bit scabious, a flower that acts as home to larvae of Marsh Fritillary butterflies, and Birdsfoot Trefoils, sometimes referred to as ‘Bacon and Eggs’ due to the red and yellow colouration of their flowers. Interestingly, the Trefoil releases dangerous cyanide when it is chewed, although it is in such small amounts it is unlikely to be harmful to larger mammals such as humans. At the edge of the oak woodland, the ground gave way to ferns, before dying out to woodland plants, such as violets and archangels, covered in tiny white spots, that act as magnifying glasses to focus light onto their leaves. Just before the meadow became forest, we found a group of three tiny Common Frogs, freshly transformed from tadpoles and making their way from the lake at the base of the meadow deeper inland. It was great to see the variety of interesting plant species that grow in our native meadows, especially as it is so easy to forget how amazing our own country is, when shown the brightly coloured rainforests of Brazil, or the volcanic tundra of Greenland. Even such a short way from home I am able to stand in an incredibly rare environment.